Sal Longo has been cutting hair for fifty years and doesn’t plan on stopping anytime soon. Sal’s Talk of the Town barbershop is a landmark in Martinsville with its traditional barbershop pole visible to all traveling on Washington Valley Road. This is where Sal has spent almost half of the last fifty years cutting hair and having fun. Sal bought the building that now houses Talk of the Town in1976. It was originally built in 1845, had no running water and came with an outhouse. With water and updates, Sal opened the barbershop in 1988 and said he tried to make the shop and waiting area definitely feel like a den or family room complete with family photos, sports memorabilia, comfortable couch and coffee table. Business has increased for Sal over the past year, “With the present economy, people are going back to the barber shops.” Asked when he plans on retiring Sal said, “When I get a real job. This isn’t work for me. I look forward to coming here. How many people can say that? 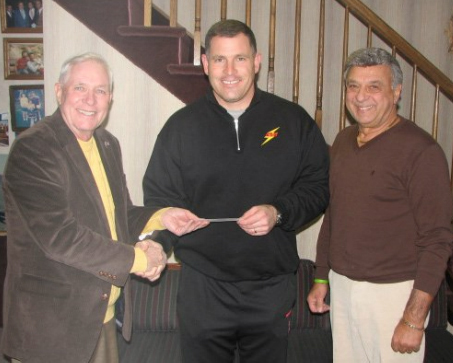 Representatives for the Trustees of "The Michael Bruce Fund" Euguene J. Kirkwood Sr., Managing Trustee of the Michael Bruce Fund Inc. (left); and Sal Longo, owner of Sal's Talk of the Town Barber Shop (right) present Greg Shiano, Rutgers Football Head Coach, with a check for $5,000. On January 10th, Trustees of the "Michael Bruce Fund" were pleased to present a check for $5,000 to Rutgers Football Coach Greg Schiano for the benefit of the "Eric LeGrand Believe Fund." "The Michael Bruce Fund," a non-profit entity, assists those who are injured and as a result are paralyzed; 100% of the funds received are directed toward injured men and women. It is a community effort that funds "The Michael Bruce Fund" with over 500 donors. The fund was created to provide financial assistance for Michael Bruce, who was severely insured in an automobile accident on November 5, 1988. Michael, a lacrosse player at Bridgewater-Raritan High School East, was on his way to take the SAT's when his car skidded on wet leaves and hit a tree. Michael was left a quadriplegic and dependent on a respirator. He was a great lacrosse player, and probably would have been the best player in New Jersey his senior year. Michael was an outstanding young man whose quick wit, easy smile, and enthusiasm for life were contagious. The "Eric LeGrand Believe Fund" was established by the Rutgers Division of Intercollegiate Athletics to support Eric LeGrand and his family. LeGrand, a junior defensive tackle for the Scarlet Nights, suffered a spinal cord injury October 16th vs. Army. For more information on The Michael Bruce Fund, please visit http://www.bridgewaterlacrosse.com/michael_bruce_fund/index.html. For more information on the Eric LeGrand Believe Fund, please visit http://www.scarletknights.com/believe/.